A pathmap simply represents a longer filepath with a short name. Since Pathmaps can be set in Global preferences this means that each computer can have the SAME Pathmap Name point to DIFFERENT folders. So.. So I simply need two pathmaps to work seamlessly on my laptop and my desktop. So long as those pathmaps exist on each machine BEFORE I load the file into fusion, everything reconnects and I’m ready to go. Use the Comp: pathmap to pass files to other people. The comp: pathmath points to the directory of the currently open fusion .comp . You can use this if you want a fusion file to load on someone elses machine without them using any custom pathmaps. Simply place its media in subfolders of fusion file. Then use the comp: pathmap in the loaders to make sure everything reconnects. 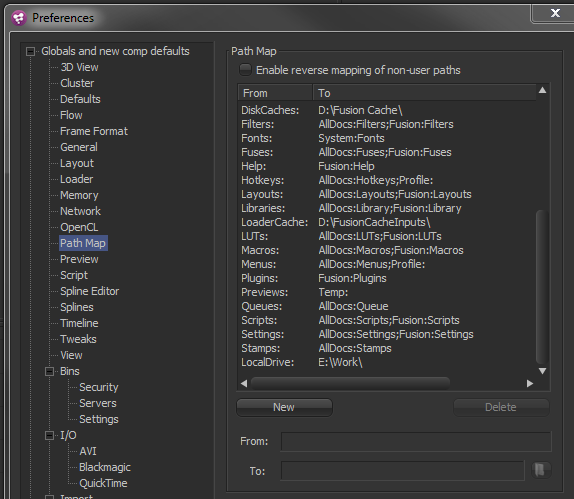 Each render node can have its own pathmaps. This is found in the fusion render node settings on each machine. So when a comp is sent off to network render each machine in the farm can grab files from the correct location e.g. a local drive on one machine can become a network share on a render node.